Iridium GO! 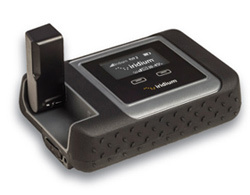 is a portable and rugged satellite terminal, providing seamless integration of smartphones, tablets or laptops with the Iridium global satellite network for voice calls, text messaging, and limited data services (via optimized apps). For limited time only! Save 10% on GO! Text plans when purchased with a new GO! terminal! Apps & Software for Iridium GO! GO! Text plan offers a great value for sending text messages—just 12 cents per each. Outbound calls USD/min. USD/min. USD/min. Each voucher has a validity term, which commences upon the voucher's activation. All prepaid minutes and other airtime will expire upon the end of the validity term, unless a new voucher is loaded to the account before the expiration date for rechargeable plans.